Rovio expanded its most popular franchise yet again today, transforming Angry Birds for sci-fi fans with a Star Wars theme. While the game is essentially Angry Birds Space with a dollop of Jedi and a mix of the previous games in the series, those yet to find themselves bored of flinging feathers will love it. Fans of George Lucas' film series, even more so. The game expectedly ruffles the feathers of its cast with Star Wars characters, each with relevant modifications. Little Obi-Wan birds wrapped in Jedi robes attack with the power of the force, a secondary tap of the screen shoving enemies aside with an energy burst. Meanwhile a Han Solo fledgeling fires his space pistol, and a Skywalker budgie flies off wielding a devastating lightsabre. Other familiar characters make an appearance too, including C-3PO and R2-D2, unlockable through bonus levels. Predictably, the pigs represent the dark side and appear as stormtroopers and other baddies, including Tusken Raiders. Some even fire lasers into the sky from their miniature TIE Fighters. Upon failure to complete a level, a cartoon Darth Swine chortles at your failure to take down his piggy empire. Failure is limited, however, by the precence of the Mighty Eagle Falcon power-up, which zaps everything with a laser as it shoots across the screen. There is a limited number of these available, but frustrated gamers can fork out for more, should they wish to fill Rovio's pockets further. Tonnes of Star Wars sound bytes accompany gameplay, although the high pitched bird "yippees" have become very reminiscent of Team 17's Worms characters. It's all too noisy and arcade-like for me, though, and my Motorola Razr i soon found itself muted to prevent permanent brain damage. 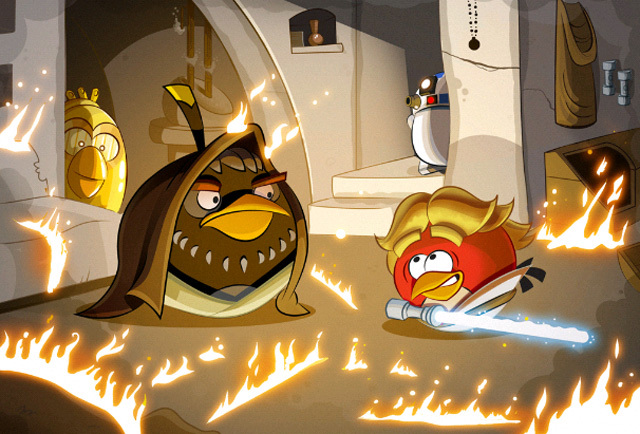 Star Wars-themed Angry Birds artwork is unlocked as you swipe your way through the game too. Rovio must have enjoyed knocking those up. The initial pack features 80 levels split between Tatooine and the Death Star, although there is the option to splash an extra £1.50 for another 40 levels based on Dagobah. A free Hoth-themed update will touch down sometime in the near future. 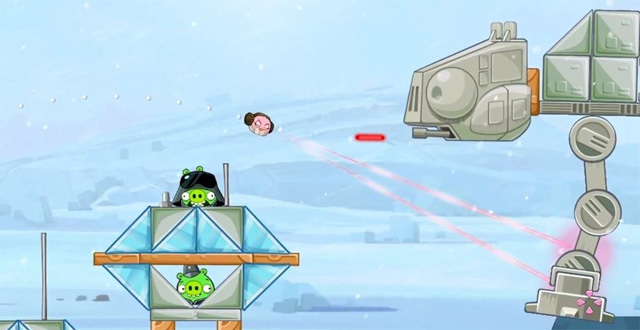 Considering the poor Star Wars games releases of late, this Angry Birds version should be a welcome boost for the soon-to-be-Disney owned sci-fi franchise. It certainly leaves bird droppings all over Kinect Star Wars.